Research suggests that your daily diet could benefit from adding a high-quality nutraceutical designed to help maintain a healthy natural defense system. The use of allicin, the primary active agent generated by garlic, for general well being is on the increase and its been widely investigated. British scientists have developed a proprietary process through which the naturally occurring allicin in garlic is extracted, stabilized and concentrated. The end result is: AlliMAX®. 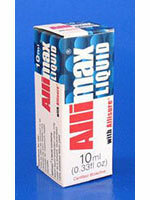 AlliMAX® is a nutraceutical with a guaranteed 100% yield of pure stabilized allicin extract. A sophisticated, patented extraction process produces pure allicin and locks all its goodness into convenient one-a-day capsules, cream or liquid.